Furry Network Blog | Are we there yet? In light of the recent management change for the website, we’ve decided to take a step back in some respects and instead focus on the original mission of the website. Our Mission Statement, itself, states that we wish to provide services to aid in and expand upon and help out with the hard work our artists and writers and photographers and just about everybody in between put into their creations. We stated that we wanted to create tools to empower and improve upon the status quo, and now that opportunity is here for us to do so. Identity is an incredibly large part of the furry community. We, as a whole, are very uniquely driven by our own personas and characters, and these often represent a part or all of us. As stated in our mission statement, Creative Media in all forms is a gateway for all of us to explore and understand ourselves through our persona, and we feel this must be supported entirely. With that said, visibility and accessibility has always been a concern within the community as a whole. We have seen it mentioned, time and again, that commissioners who wish to bring their inner selves to life struggle to find that perfect artist to help them bring their creation out into the world.. On the flipside, we’ve seen many willing artists, who all wish to help the community and bring characters to life, struggle to find and acquire commissioners who might be looking for work at this very moment. This is, in essence, a very undesirable situation. We aim to resolve this with some great tools, designed to bring the community closer and make the commission process more streamlined. We want our commissioners and our artists to find each other, so that we can all become closer as a community and share our skills and talents with each other, and bring all our creations to life. Our latest update to the website features expanded Commission Marketplace tools, as well as expanded features for all artists who wish to offer commissions to the community. We have released this product now as its simplest essence – a market where artists can highlight their work, and where commissioners can engage them. But we don’t plan to stop there – with the feedback we receive from the community in a dedicated support area, we will build better experiences for artists and commissioners. Think of this as helping us build a park in the way that you feel benefits the community as a whole. That said, this is still an entirely new product that we’re offering, and an entirely new venture on the site. The current state of the system may be simple, but look at this as sort of a blank canvas to build upon and build out. We worked hard to get our tools to a great place to start this effort, so much so that any artist and consumer can opt in and complete purchases on their own, from start to end. This is, after all, a major goal we wish to achieve. Our initial test will involve working with a small group of artists, specifically, to make sure the system is simple and usable before we open it up to more users. We will be expanding on this actively, once we ensure we smooth on the onboarding and transition period. This launch will come over time, but we want to get this into the hands of everybody as soon as reasonably possible! Every artist will have access to an easily configurable tool that will allow them to “open” and “close” commissions, based on their availability. Customers can opt in to notifications as well, so that they will be emailed each time a product is made available. Each “product category” will link customers to a new page, so that all examples of the product offering can be viewed by the customer, so that they know what to expect. All of these example images can be populated from your gallery, there’s no additional need to upload more than what you already have. The “request” screen currently supports the direct upload of references, so that artists and commissioners do not need to fumble around with links and worry about having to search around for them. They are all in one place! Future plans have us expanding out this system. All communication is handled through the internal system of communications we have, which includes the ability to share WIP pictures directly and swap updates quickly and efficiently, so that every part of the commission process is in one place. All payments will be handled by our own internal payment processor, CCBill. As such, all arbitration and payment disputes will be handled by us directly, in order to better meet the needs of our clients that currently utilize payment services that might have more restrictive policies. During testing, all processing fees associated with this will be free, while we work to get all features online and accessible. The final fee for utilizing our services will be determined before the full, final launch of the system, but we we expect it to be competitive with services you already use. Thank you again for all being apart of our community! We look forward to working with you all! In the first of many new changes coming down the pipeline shortly, we’re announcing a change in management. Feel free to contact me at on my FN page or at my email, devildoge@furrynetwork.com. You can also contact me on the official Furry Network Twitter account! I look forward to building a whole new realm with you all! The recent changes to the site appear to be working well, and the layout has had some substantial improvements, especially in helping share others’ submissions. I’ve personally enjoyed going through users’ promote lists and finding new artists that I could follow. If you haven’t done so yet, I’d recommend browsing a bit and checking out others’ promotes – you’re bound to find something new! Our current large project is with wrapping up the commission system. The backend has most of the kinks straightened out, and now we’re working to make this both easy to use and attractive. We want this to have the flexibility you need while staying simple enough for new sellers to use without a manual. Another exciting thing we’re looking into is the ability of cross-promotion with other sites. We realize that some users, especially those who are just joining, may not have the biggest audience. Fortunately, we have some connections with larger sites, and we’re working on providing an advertising service for those. We know that costs are something that sellers want to minimize, so we’re aiming on making this service free for all users. We’re excited to see what comes next. Stay tuned! Our developers have been hard at work making changes to the site. Some of these changes are mostly visual, but there are a few I want to highlight that will make a huge difference. Featured submissions will now appear on the right side of the home page. These are hand chosen by staff, so we’ll be working to try and have a variety of styles featured throughout the upcoming weeks. We especially hope this can help upcoming creators get more attention on the site. In addition, the home page now contains Recent Submissions. This is a feed that shows a timeline of submissions from people you’ve followed. If you don’t follow many users at this point, recent popular submissions from the site will also appear here. If you prefer the option to view and clear out submissions you’ve already seen, we also have the Inbox option listed in the left menu of the home page. One issue we wanted to tackle with this update is the difficulty of finding new content creators on the site. Because of this, we now have Promotes Galleries on every user’s page. This appears on the left hand side of all users’ profiles, and it lists all promoted content starting from most recent. In addition, users can now add a Promotes Section on their own profile page if they visually want to show off what they’ve promoted. At this point, we’re going to work on tweaking some bugs on the site as well as finishing up the commission tool. As we do this, we welcome anyone with feedback to post on our support site. We’re excited for what the next weeks bring! Recent Submissions. View recent submission from users you follow by submission type on the homepage. This is the equivalent of the “Following” section on the current homepage, but in gallery form. Keep fresh content on the homepage gallery. If a user doesn’t follow very many characters, or the people they’re following aren’t posting frequently, items published by anyone within the last day with at least two promotes will help populate the gallery. Left sidebar. In the left sidebar of the homepage, there now exists a section called “Your Community” with links to Home, Activity History, Inbox and Favorites. The second section, “Your Profile”, contains links to edit your profile, manage submissions, import data and commissions. Right sidebar. 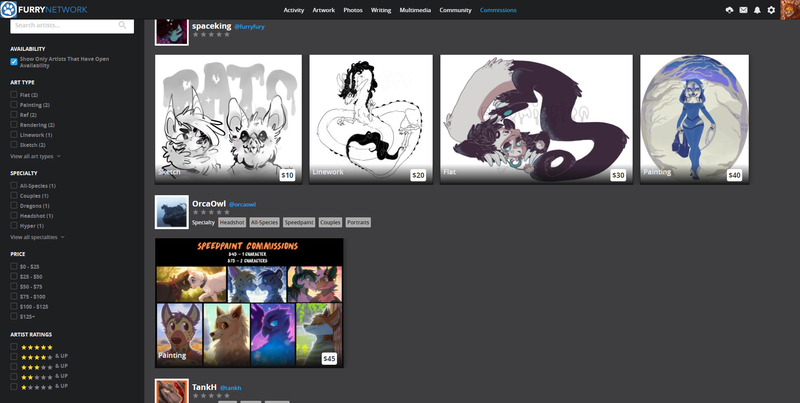 The right sidebar displays four featured commission artists with a “view more” link to the Commissions landing page. Below featured artists there are sections for featured media type of the day for Artwork, Photos, Stories, and Multimedia. Featured content. The featured content in the right sidebar can be set by an admin. Added promotes section/gallery on each user’s profile. A link exists in the left nav menu of a user’s profile that allows you to view their promotes. As we’re working towards some large changes to the commission system, I wanted to take a little time and talk about some of our users and testers. I had the lucky opportunity to interview with AilurusMursus. She’s been highly active on Twitter, and she’s been posting furry artwork since 2014. Her artwork, beginning with a sketch style, has blossomed into a variety of types including digital and traditional media. She is open for commissions on Furry Network, so feel free to go get some great art! It’s great to have you! Tell us a little about yourself – passions, hobbies, and perhaps a little background. I’m curious about your name. I know that Ailurus fulgens is the scientific name for the red panda, but I’m unsure where “Mursus” comes from. How did you come up with your name? I’m going to be honest – red pandas are absolutely adorable, and I’m not obliged to say that even though I married one. What drew you to red pandas the most? I learned of them a few years ago and honestly the second I experienced them, the connection was instantaneous. The initial reaction was, of course, they’re my favorite color, always a plus! That and, as you said, they’re just so dang adorable! When you look deeper at them, however, they have such a unique personality as a species, and their anatomy fits features I enjoy so well. Very bear-like, cat-like, raccoon like, but somehow they still put their own spin on it. Really, they’re just a species I’ve found I deeply connect with, and sometimes that can be inexplicable. I honestly could never see myself as anything but one. What I love about watching your art on Furry Network is seeing the variety of art. You’ve done traditional painting, sketches, digital art, and lapel pins, and that’s all just in the past month! What keeps you creating with these different types? What do you end up loving the most? Right now, I believe you’re open for commissions. What part of the commission process is the most fun for you? To go along with the above, definitely the sketching! I really love the start where you’re messing around with poses, seeing your options, trying to get that initial imagery to fit your commissioners descriptions! And they’re always so moldable. Oh that arm didn’t come out right? Re-done! Commissioner would like to change the outfit? Just some quick extra sketching! I tend to sketch pretty quick too, so it’s extra rewarding in that aspect as well! Furry Network v1.6 is now live! This one is a big one – the layout has changed significantly, especially for the different gallery pages. Navigation has been confusing for some users, so we worked on making it easier to follow. The different site galleries are available at the top, and the various filters appear directly under those. In addition, the upload button has moved to an icon in the top-right of the screen. We’ve also had some large changes with the formatting of the profile. All menu options are at the left of the profile, and every profile page has the same general format – no more reloading the page when switching between users’ profile, gallery, and activity. We have a handful of other changes with this, as well. We are also more than happy to hear if users encounter new bugs on our support site. Updated character profile and submission gallery layouts. The character banner and sidebar are now visible for all character-specific views, profile nav between different sections are all consolidated in the sidebar (dropdown on mobile), media submission pages now resemble the gallery pages, with sorting options and tag filters. Updated mobile gallery filter view. The filter modal has been updated and now opens/closes via a button at the top of the page on mobile. Updated gallery grid view layout. Gallery views have been updated to match the new layout, with nav and filtering moved to the top below the header. Updated the header to the new layout. The new header now links to galleries for the various content types and to commissions. On mobile, the nav is now in a hamburger menu in the top right of the page. “Commissions” option now links to /community/accepting-commissions/ until we implement the new Commissions section. The left margin is smaller than the right margin on various screens. This is especially noticeable on mobile. Images are larger than before on mobile. We plan on shrinking them back down. Additional improvements to the profile page. Add review system for commissions. Create a dynamic home page for users. Create a customizable price sheet page. Thank you all for your excitement! We are ready to charge forward and finish the commission system in the coming months. 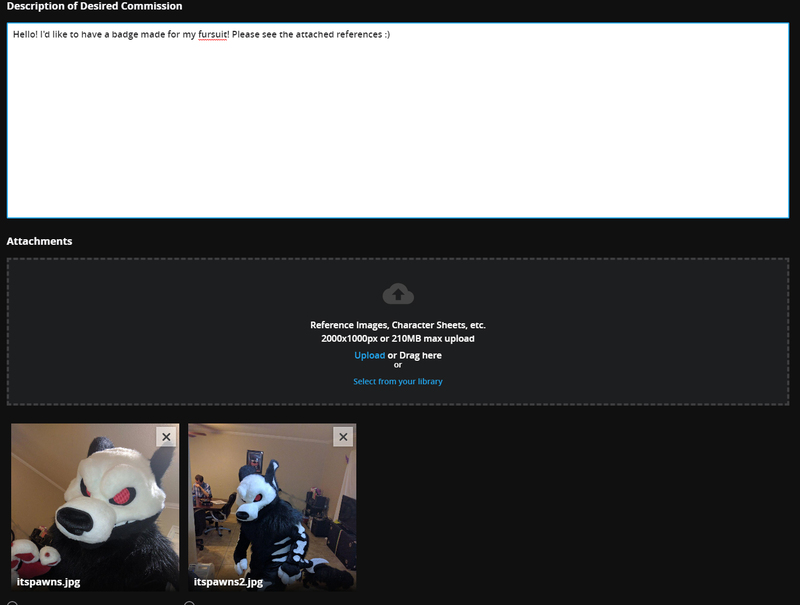 We’re currently wrapping up development for some changes that will improve navigation on Furry Network, and we’re gearing up to work on the commission system. One major part of this is the price sheet. Until now, the fandom has generally had large, static images showing prices and art types. This has worked fairly well, but it comes with complications – updating the sheets can be a pain, and side projects can have their own information aside from the price sheet. We’ve worked on a system that captures the purpose of the price sheet while standardizing the look and feel – this way, sections can be updated quicker, and sellers won’t have to reinvent the wheel every time they create something new. All designs are subject to change, of course, but we’ve created a section for users to browse through the different categories available from an artist. The highlighted image is chosen by the user from their portfolio, and clicking on that specific commission type will take you to a page with more information (and more pictures). We’ve also looked at an option for putting all the information on one page; the main issue that we found, though, was that viewers tended to get bogged down on the information. They would prefer to read the information for the commission type that interests them. What do you think? Is there anything else that you’d personally add? Anything that you’d change? Let us know! As always, thank you for your excitement as we work towards finalizing site features. We had a small update today for Furry Network regarding administration broadcasts. Staff may now occasionally send an update across Furry Network that can be dismissed from the home page. Next week, we will hopefully have an update regarding navigation changes – this will both improve the current layout of the site and prepare for the upcoming commission changes. Built in page for creators to “sell” themselves. Standardized information gathering when requesting a commission. Flexible pricing for creators to match the changing market conditions. We talked about independent artists and the unique value that the fandom has for them – it’s difficult to make a living as a creator, but furries have managed to keep many artists afloat. It’s amazing to see how much support the fandom gives creators despite the lack of a solid commission system. We want to help make the dream of being an independent creator become a reality for even more furries. Over the next few weeks, we’ll be looking at possible designs and getting feedback about what works and what doesn’t. From there, we’ll continue to hone the design to the specific needs of the fandom. There’s a good amount of work to be done, but we’re planning to keep development active until this is completed! Thank you for all your support and excitement for the commission system.